What is the Spanish language? What can I learn about the Spanish language? The Spanish language has its origins in the Iberian Peninsula, having evolved from several dialects of Latin. It is part of the Ibero-Romance language group, along with Castilian (another word for Spanish)*, Portuguese, Catalan, and Galician. It is also part of the Romance language group, along with French, Portuguese, Italian, and Romanian. Spanish, or Castilian, became more widespread through the expansion of the Kingdom of Castile, that unified northern Spain with central and southern Iberia in the late Middle Ages. The unification of the kingdoms of Castile and Leon under the Reyes Católicos (Catholic Monarchs) Ferdinand and Isabel, along with the rise of the Spanish Empire, solidified the place of Spanish among the top three languages spoken in the world. Castilian and Spanish are synonyms for the Spanish language. However, the usage of Castilian is due to the fact that there are many different languages spoken in Spain; thus, to call one of the many other languages “Spanish” would assume that none of the other languages spoken in Spain are also Spanish or of Spanish origin. The other languages of Spain, both official and unofficial, are Galician, Basque, Catalan, Aranese, Asturian, Aragonese, Extremaduran, and Fala. *Castilian in Spanish is castellano. What are some Spanish language words? Arab words began finding their way into the Spanish language up from the south of Spain around the 8th and 9th centuries. The region of Andalucía, once known as Al Andalus, was the center of Arab and Muslim culture in the Iberian Peninsula. When the Christian Reconquista (Reconquest) by the Kingdom of Castile occurred in the 11th, 12th, and 13th centuries, former Arab-speaking regions found themselves speaking Romance dialects and contributing many of their words to the various languages. Below you will find examples of this influence that are still in use today. As you can see, the Spanish language is a diverse language that has influences from all over the world. Throughout your Spanish language-learning journey, see if you can spot other ways in which Spanish has been influenced by the world around it! Many words in Spanish are indigenous words that were incorporated into the language during colonization under the Spanish Empire. Among the languages that contributed words to Spanish are Nahuatl, Arawak, Guaraní, Quechua, Tupi, Carib, and Maya. Below are a couple of examples of common Spanish words that didn’t exist in the Spanish language until the discovery of the New World! Many of the words contributed to the Spanish language from indigenous languages are food words, which makes sense since the tropical fruits and vegetables found in the New World were unknown to Europeans and so had no translation. Did you know… that tomatoes and potatoes were introduced to Europe only after the discovery of the New World? That means that the traditional European diet of “meat and potatoes” is relatively new, and that Italian cuisine was nothing like it is today. Imagine Italian food with no tomatoes or tomato sauce! ¿Sabías que… los tomates y las papas sólo fueron introducidas a Europa después del descubrimiento del Nuevo Mundo? Eso significa que la dieta tradicional Europea de comer “carne y papa” es bastante novedosa, y que la cocina italiana no se parecía en nada a la que conocemos hoy día. ¡Imagínate comer comida italiana sin tomates o salsa de tomate! • There are between 450 and 500 million Spanish speakers worldwide, with 40 million of those living in Spain, 360 million in Hispanic America, and more than 35 million in the United States. • This makes Spanish the second most spoken language in the world after Mandarin Chinese and above English. • Spanish is the third most used language on the Internet, after English and Mandarin Chinese. • Mexico has the most Spanish language speakers in the world, with over 112 million speakers. • Spanish is one of the six official languages of the UN. • Equatorial Guinea is the only African country to have Spanish as an official language, having once been a part of the Spanish Empire. • There are 24 countries in the world with Spanish-speaking populations, including the U.S.
Did you know… the U.S. does not have an official national language, though English is the de facto language? ¿Sabías que… los EEUU no tiene un idioma oficial, aunque el inglés es el idioma de facto? Quick, how do you say “budget” in Spanish? How would you translate the phrase, “To Whom It May Concern”? Why is “application” not the same as “aplicación”? There’s a difference between everyday Spanish and business Spanish! This hands-on guide to Business Spanish is a must-have book for Hipanics and Latinos working in the U.S.
As the United States becomes a bilingual consumer economy, Hispanic and Latino professionals find that their lack of fluency in Business Spanish creates a linguistic obstacle that hinders their progress in advancing their careers. What are the key words and phrases that everyone must know if they are to make themselves understood clearly when speaking or writingBusiness Spanish? This book provides the more than 250 words and phrases that translate into career success. 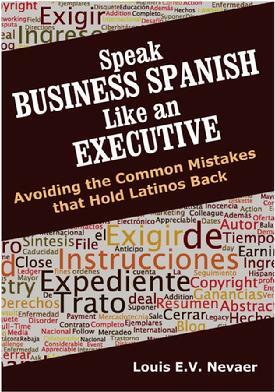 Speak BUSINESS SPANISH like an EXECUTIVE: Avoiding the Common Mistakes that Hold Latinos Back provides the necessary vocabulary that gives confidence and assures the speaker. Written with wit and in a conversational tone, the book is never condescending and always illuminating. TO PURCHASE FROM AMAZON.COM, CLICK ON THE IMAGE OF THE COVER TO THE LEFT.